Is it fair or right for a country of more than 40 tribes to be led in all of its history by only two communities which exchange presidential leadership? Since independence, Kenya has been led by the Kikuyu, who have dominated presidential leadership and the Kalenjin, who luckily got in between on account of Kenyatta naming Moi as his vice-president, not with a view to one day succeed him, but altogether for different reasons. Moi just managed—and initially barely so—to cling to the presidency upon Kenyatta’s death. No one expected Moi to last more than the constitutionally provided 90 days within which a new president was to be elected—or more accurately, selected among the ruling class, elections merely being a rubber-stamping of some kind. Thanks to the likes of the eminent Briton who never was Sir Charles Njonjo, Moi quickly figured how to entrench himself as president and the rest is history, including the fact he ended up ruling our country more than Mzee Jomo Kenyatta. Moi was, of course, succeeded by Kibaki, another Kikuyu as our next president. Interestingly and really the point of this blog, Moi himself preferred another Kikuyu and none other than Kenyatta’s son Uhuru to succeed him. Thanks to efforts by political giants like Raila, Moi’s Uhuru project was resoundingly rejected by Kenyans who ushered in Kibaki in a euphoric election of 2002 which many believed would lead in transforming the country. They were wrong as soon after being sworn in as president, Kibaki defaulted to yet another tribalist president stuffing all key government positions with his cronies and other members from his community. So much so one embassy was staffed by members from his community, one passing by and hearing ordinary day to day chat in the office would be rightly mistaken to believing they were deep in a village from Kibaki’s neighborhood. With the dominance in presidential leadership, so has been the case in the allocation of resources in the country besides jobs, which clearly and indisputably favor the Kikuyu community. This is simply neither right nor fair as other communities are left to scramble for crumbles, if at all. One of the reasons Raila has been mercilessly opposed in the Mount Kenya region is because there are many there who believe presidential leadership belongs there and no one should even bother seeking to yank it from them. Uhuru, for his part, believes presidential leadership is his birthright. Both notions are wrong for several reasons. First, Kenya as in many other countries has never embraced dynastic rule, even though one can argue that the dominance by one community in presidential leadership is no different from a dynastic rule. Voters must reject this notion of dynastic rule come March 4, 2013. Second, underlying the thinking among those who hold the view presidential leadership belongs to the Mt. Kenya community is this sense of misguided belief that one community from that area is particularly superior to all others, which is pure nonsense. It’s actually this kind of thinking that has created hatred and animosity among tribes of all manner in many countries, most notably Rwanda where the 1994 genocide is attributed to this backward superiority based ethnic and tribal divide. Third, closely related to this backward superiority thinking, is tribalism. There are those from the Mt. 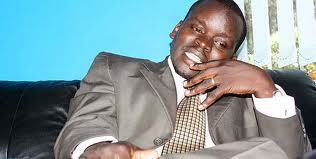 Kenya region who believe that no other tribe other than theirs can lead the country. This is obviously so wrong and backward there is no need to elaborate as to why other than to say we are all Kenyans and each community has the right as any to have a president elected from within its community. To say this or that community cannot lead a country is both nonsensical and primitive those holding the view must be ashamed, if they have any shame at all. Fourth, there are those who argue it’s discriminatory or a form of tribalism to urge Kikuyus to give us a break from yet another presidency from the community. This is simply not the case; there is nothing discriminatory, divisive or tribalist in making the plea or holding this view. Indeed, there are many from the very same community who have made the same plea and see nothing wrong with it, which there isn’t. This is just a question of fundamental fairness to say other communities also must be given the opportunity to lead the nation. It’s also a question of fatigue; we are simply tired of being led by one community. This is not even a phenomena confined to Kenya as other countries have much come to the same conclusion as to their own presidential leadership. In the United States, for example, former president George H Bush was followed a few years later by his son George W Bush as president—this in a country with a population of more than 300 million. When George H Bush’s other son and former governor of Florida Herbert Bush wanted to run for president in 2012, he was prevailed upon by people who told him it was not a wise move because Americans were simply tired of being led by the Bushes and besides it was akin to trying to create a ruling dynasty, which Americans long rejected. Hebert Bush heeded the advice and did not vie and rightly so. Someone should have prevailed on Uhuru not to vie for the same reasons but that would have been an exercise in futility as the man is determined to vie for reasons that go beyond his belief the presidency is his birthright or that the same belongs to his community. Fifth, the constitution attempts to force this issue of not having one tribe win the presidency merely due to its numeric majority by the strict requirements as to who can be sworn as president, especially in its regional vote requirements but that’s not enough to prevent yet another Kikuyu from being elected as president, at least not this time around, given we have already had two presidents from the community. 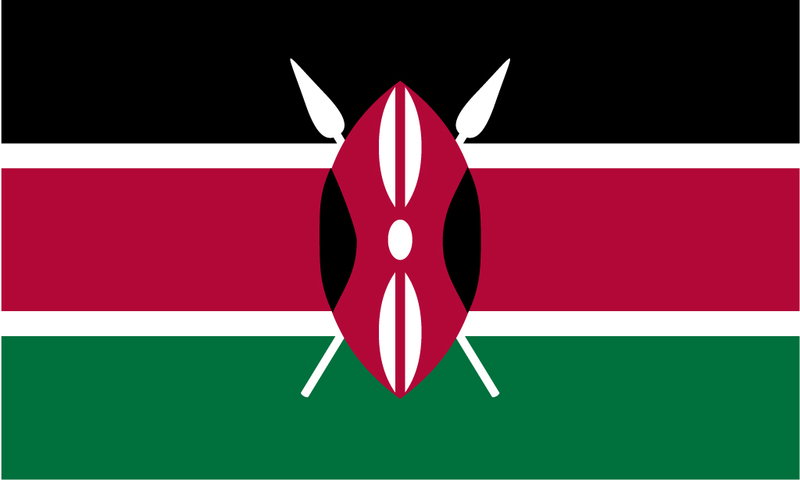 It’ll take the wisdom of Kenyans going to the polls on March 4, 2013 to make that happen as it should. Again, there is nothing tribalistic, divisive or discriminatory in urging our brothers and sisters from the Kikuyu community from giving us a break from yet another presidency; this is just a question of fairness and fatigue anyone objective would have to see it that way. As others have said before, the election of Raila Odinga as our next president will go a long way in ending tribalism and his harvesting of votes in the former Central province will be key in that outcome. Thus, those from the region must ask themselves is it in the country’s interest to end tribalism and if so, would they like to be a part of that eventuality which is certain to come, anyway. On the other hand, the election of Uhuru Kenyatta will be condemnation of the country to dominance of one tribe at the expense of all others, which is unfair, not right and undemocratic notwithstanding its occurring in a democratic process. 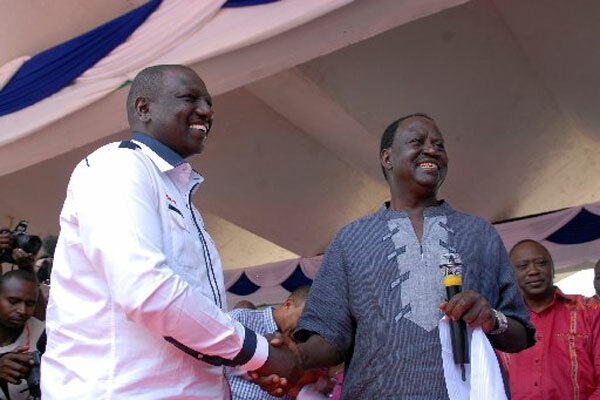 Raila and Ruto publicly forgave each other at Dr. David Oduor’s prayer rally. This was a significant act for several reasons. First, it shows that even among enemies, real or otherwise, forgiveness is possible. Second, given the history of these two men, and particularly given Ruto’s relentless attacks on Raila largely based on falsehoods, Raila comes out as yet again put country first and himself second by apologizing to Ruto when there was little he really needed to apologize for. This is akin to a couple agreeing to apologize and let go of an issue they know they are right for the sake of peace, which is nonetheless commendable for the peace is worth it. Third, Raila and Ruto forgiving each other publicly will have a positive effect on Raila in RV because it’s a way of Ruto signalling to the Kalenjin community Raila is after all not as bad ad he had made or tried to make him come across to those who follow him. In essence, Ruto is saying to the Kalenjin community vote for Uhuru at your own peril. This is true notwithstanding the fact Ruto is Uhuru’s running mate because even he deep inside knows a Uhuru presidency does not have much promise for him (Ruto), let alone the Kalenjin community and all Kenyans for that matter. On the other hand, a Raila presidency does, in fact, have promise for all, including Ruto who will certainly fare better under a Raila presidency than Uhuru Kenyatta’s. Let’s all commend the two leaders especially Raila for this act of brotherly love. Raila’s and Cord will today hold an historic rally both in terms of attendance and significance marking the beginning of the march to victory and even then the mother of all rallies has yet to happen but shall in the few remaining days. Those with their heads buried deep on the ground, kindly un-dig your heads from the ground and open your eyes to see what most of us have been seeing all along and that is, this time Raila is unstoppable and so will Cord sweep the country much as ODM did in 2007. Those sitting on the fence, it’s time you jubilantly moved to the right side of politics in 2013. Those fully corded, it’s time to have all your friends and family not yet Corded do so their pleasant amusement. Just talked to a friend from NEP who the rest of her family has not been Corded and tells me they now are, thanks to her efforts to explain to them what is at stake and specifically using the example of her brother she’s there to take to take to school (Form 1). She emphasized Raila and Cord’s commitment to provide free primary and secondary school education, a goal Raila is fully committed to and says when he says “free” education, he and Cord mean free education, not free in part and still requiring parents to scrape to find money to cover other related expenses. I meant to ask my friend how come her brother is starting tomorrow when I thought the start date is delayed until after the elections but this may be a situation confined to that area schools. That’s what we are talking about; people being persuaded to vote for Raila not on the basis of tribalism as clearly that’s the case with Uhuru and Ruto, but on the basis of what he has proven he can and will do to make a difference in ordinary people’s lives. That’s the spirit and new Kenya we want each of you reading this has the obligation to our beloved country to assess and vote for candidates who stand with ordinary Kenyans with their needs, not the narrow, selfish needs of the candidates, thwarting or even altogether defying the ICC, the main and only reason Uhuru and Ruto seek the presidency despite the serious crimes against humanity they face. Whether you have been supporting Raila or not; this is the time to be even more committed and doing what you individually can to help Raila get re-elected but this time sworn, if you are a supporter, or time to re-evaluate and ask yourself the question who really among those vying, especially between ICC indictee Uhuru Kenyatta and Raila Odinga is better experienced and suited to be our next president and if you were to be objective and not judging things strictly from the tribal prism, that choice is clear and that is, Raila Amolo Odinga. In the case of the latter, open your eyes and see that reality as it’s not too late and while at it, get your friends and family who may be in the situation you’re to see the same thing after you do. I say that fully aware there are those who are so far gone, doing this, namely, changing their tribalism based views on Raila is impossible but my appeal is to the more practical and less gone or otherwise the more reasonable and potentially fair among them. That being said, I am confident Raila and Cord will prevail come March 4, 2013 for these same reasons noted above, namely, it’s the only team ready to tackle issues affecting ordinary Kenyans and not Jubilee which really could care less. Again, as Raila has been saying, Mambo Bado but after today’s rally, one can safely assume mambo yataanza climaxing with Raila’s reelection but this time being sworn as our next president as Mombasa marks the beginning of the final leg of this journey Raila has been on for a very long time. Godspeed our president in waiting Raila Amolo Odinga. To put this analysis in perspective and just so there is no confusion as to why it’s being penned, let me restate what I have been saying for a long time and maintain the view and that is, Raila will be reelected but this time sworn as president in what may not even be a close margin but, rather, a landslide–and by that I mean Raila and Cord winning by more than a 5 point margin. That being said, let me also remind those who have forgotten what I have previously said about the ICC or inform those who are unaware that I have maintained from Day 1 that Raila’s winning the presidency is not predicated on the status of now wannabe president and deputy duo Uhuru and Ruto. That being said, what I have been scratching my head for some time is, how is it the ICC indictees Uhuru and Ruto are even vying for the presidency? Why is it then in Kenya the ICC inductees have not only put themselves forth as presidential candidates and now teaming up as presidential and deputy presidential candidates, but have, de facto, been cleared by the courts to so vie? We know the ailment very well as it has been the reason we have had rotten government for decades and this is tribalism and negative ethnicity. There is nothing that can explain Uhuru and Ruto’s vying and having a large following to the point of being competitive with a proven leader and champion of reform like Raila Odinga other than this disease that’s threatening to drop our country into even more unpleasant gloom and doom, given the consequences that lie in wait were the duo to emerge as winners on March 4, 2013. This then begs the question, what should Kenyans of good will do to prevent our country being hurled over a cliff by these ICC inductees who obviously have no interest or desire to do anything good for the country other than the pursuit of their narrow, selfish interests mostly related to their status as ICC inductees? Time does not allow to go into a deeper analysis exploring all the possibilities as to what can be done but let me highlight only one thing that can be done with ease by all of us in that mindset, namely, those who stand for the proposition our country cannot be led by ICC indictees either too busy defending themselves at the Hague or who would bring calamity of the worst kind to our country by their very likely thwarting or altogether defying the ICC turning our beloved country into a pariah state with concomitant harsh consequences. This is simply let’s not seat by the sidelines and hope for the best. There are simple things anyone in that category, meaning, Kenyans who as common sense dictates would not want to be ruled by ICC indictees Uhuru and Ruto as described above–there are simple things we can do to have an impact and that’s simply to educate and inform those either in denial or blinded by tribalism and negative ethnicity that remaining in that posture, or even more importantly, voting on that basis for this duo who objectively should not vie for any public office until cleared, may give them temporary satisfaction of keeping these vices alive but the net-outcome is they will suffer much the same with everyone else once these two achieve their objective and pursue their ICC strategy without caring one bit about the lives of those voting for them in this blind and ill-advised manner. Only insanity can prevent us from seeing this and doing the right thing and I include in that being in total denial or simply guided by raw tribalism and negative ethnicity. The elections of 2013 is therefore now set as a referendum on whether we want to remain stuck in the past where tribalism and negative ethnicity looms large in electing leaders who only perpetuate it to their self aggrandizement, or we forge forward to a new Kenya were neither vice is the major determinative factor in who we elect, especially at the presidential level. That’s an easy call for any Kenyan who loves or at least cares about our country can make. Each of us has a say in which of this outcome becomes a reality come March 5, 2013; my hope and prayer is the majority of us making the right choice will be the ones prevailing come March 5, 2013. That’s a basic duty in any democratic society as we intend to make ours and prove to the world we can be counted among the sane democratic societies. 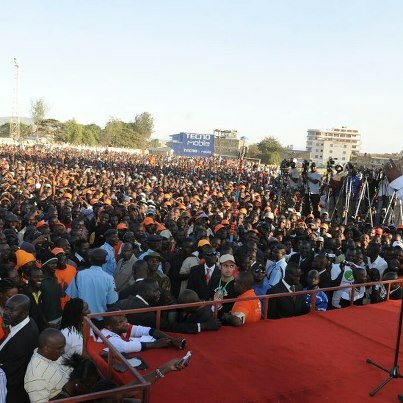 Raila addressing mamoth rally in Nakuru today. 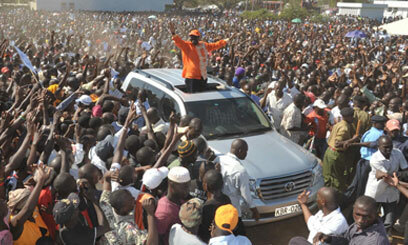 Raila and Cord took their campaign to Baringo and Nakuru counties today. In one of the rallies held in Kabarnet, Baringo County, I arrived early to witness the normal work done by the advance teams and as the crowd started gathering, I noticed a sizable number of attendees sitting across the field away from where everyone else was gathering, which I thought was peculiar. I inquired from a friend and the head of the advance team what that was all about and he indicated they may be fence-sitters who may not have been sure whether to join the rest of the rally or would prefer to watch things from a distance. Once the rally went underway, and before Raila and other guests arrived, normal pre-arrival of Raila and guests activities were taking place at the stage, including entertainment by the DJ and a comedian most notably known for his excellent imitation of Moi and Raila. Upon Raila’s arrival, the true intentions of the group across the filed became apparent and known when they started heckling speaker after speaker, including Raila himself. Fortunately other than Franklin Bett who the small group constantly heckled, Raila carefully made his remarks to avoid giving them fodder to heckle. At several points, though, Raila addressed the hecklers directly and in cleverly making the point why it’s not right or fair to keep having a president from one community, Raila compared that to a polygamous husband who only visits or stays with only one of his many wives to the others’ dissatisfaction and pleas for the man to spend time with them, too. This drew quite a cheer from the crowd, except the hecklers who may have been taken aback from Raila and his apt analogy. As all this was going on, I actually went across to the area where this group was and engaged a couple of them, pulling each at the time to the side and wanted to know to know why they were heckling the speakers–politely and diplomatically, of course. I disclosed to them I am a Raila supporter and friend just so they knew where I was coming from. To my surprise, they each told me the same thing: they were paid to be there and heckle Raila and other Cord speakers but truth be told, they do not disagree with anything Raila and the other speakers were saying. Even more unbelievable but true, they each told me they’ll be voting for Raila! One of them, who told me she is a college student, even offered to be of help to the campaign in whichever way she could but knowing this could be a perfect opportunity for a mole application, I probed her further and came away convinced she was, indeed, genuinely telling me the truth. She was actually very articulate further confirming for me she was a college student. Following this exchange, and after the rally peacefully concluded, I learned from a reliable source that Jubilee is planning to pay and bus college students to Mombasa tomorrow (Sunday) to do the same thing, namely, heckle Raila and other Cord speakers at a rally scheduled there tomorrow. Anyone connected with Jubilee reading this and I am know Jubilee people read this blog, my message to Jubilee–and this is really a message from all peace loving Kenyans, is they (Jubilee) should forthwith abandon this shameless shenanigans and dirty politics of paying hecklers to heckle Raila and other Cord speakers at their rallies. It goes without saying that Jubilee must let every politician seek voter’s support without paid intimidation and heckling, which is backward and undemocratic. Paying people to heckle or otherwise disrupt or disturb an opponent’s rally as is clearly the case in this case is the height of hypocrisy coming from a group whose leaders are facing serious ICC crimes against humanity which ordinarily would be a bar to anyone seeking office, let alone high office, yet this duo claims they are doing so in the name of democracy and giving people choice, which we know to be false, anyway as analyzed in Why The Kalenjin Should Not Be Misled By William Ruto when the duo is busy engaging in this very shameless and undemocratic shenanigans and acts of desperation. If anything, Jubilee must know while it may have succeeded in having heckling without incident in Baringo, this was actually due to tactical out-maneuvering by Raila who steered clear and asked others to stay clear of hot button issues that would have given the paid hecklers reason to up-the-ante. It also helped this was an homogeneous community in Baringo; Mombasa is not therefore one cannot expect the same results unless the results one can expect is what Jubilee seeks. Shame on Jubilee for paying people to heckle Raila and Cord but how sweet to know this is wasted money–not that it matters to these people in Jubilee–but nonetheless sweet to hear these paid hecklers saying they will take the money but vote for Raila and Cord, anyway. If for anything else, Jubilee should abandon this backward and undemocratic antics for this reason alone, namely, it;s a waste of their money whether they care or not. The implication of this on peaceful rallies is, of course, paramount and Jubilee will have no choice but cease this tactic they naively believe could stop the unstoppable momentum for Raila and Cord toward yet again sweeping the country with victories, including the biggest of all.